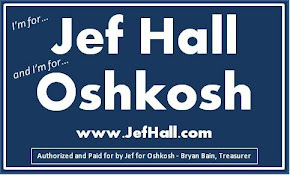 Jef Hall - Oshkosh Common Council: Sign up for Oshkosh's Citizen Academy! Sign up for Oshkosh's Citizen Academy! The City of Oshkosh and the Oshkosh Northwestern both have announcements for the upcoming Oshkosh Citizen's Academy. I attended it back in 2006. It is a great way to get to know your government. (Oshkosh, WI.) Applications are now available for the 13 week Oshkosh Citizens Academy hosted by the city of Oshkosh. Approximately 20 applicants will be selected to participate in the educational sessions, which begin on Monday, September 12, 2011. The program is focused on educating Oshkosh citizens and business owners about the functions and processes of the city. City staff will host informative, two hour sessions designed to give participants a behind-the-scenes experience in city government operations. Each session will run from 6:00 p.m. – 8:00 p.m. on Mondays. General requirements for applicants are that participants be 18 years or older and commit to all 13 sessions. Applications are available at the Oshkosh Public Library, City Hall in the City Manager’s office or Oshkosh Community Media Services, and on the city’s website, www.ci.oshkosh.wi.us. Applications may be submitted via email to dleisgang@ci.oshkosh.wi.us or mailed to Oshkosh Community Media Services, Attention: Dean Leisgang, 215 Church Ave. Oshkosh, WI. 54901. The application deadline is August 19, 2011. For more information on the program please contact Communications Coordinator Dean Leisgang at (920) 236-5269 or dleisgang@ci.oshkosh.wi.us.